Businesses, churches, schools and other organizations throughout Central PA are embracing the use of audio-visual technology for their facilities and meeting spaces. Hi-tech audio systems, video wall displays, digital signage, and of course TVs & projectors are in demand with our business clients. Sharing concepts, ideas, and information is vital to any business or organization. With the rapid advances in flat screen and projection technology, sharing this content in stunning HD has never been so affordable. Let us transform your meeting rooms by installing HD displays and projectors that are easy to connect to and simple to operate, without all the cords and clutter! One call to TCW-GAV and you’ll be sharing your ideas simply and effectively before the next big meeting. Think of digital signage as your 24-hour virtual receptionist. It’s a professional, engaging and versatile way to communicate with your audience. In fact, research shows that individuals are more likely to stop and read information on a digital signage display than on traditional, stationary signage. Digital signage can be installed indoors or outdoors and today’s display technologies allow clients to easily update their signage messaging and direct it to multiple locations. 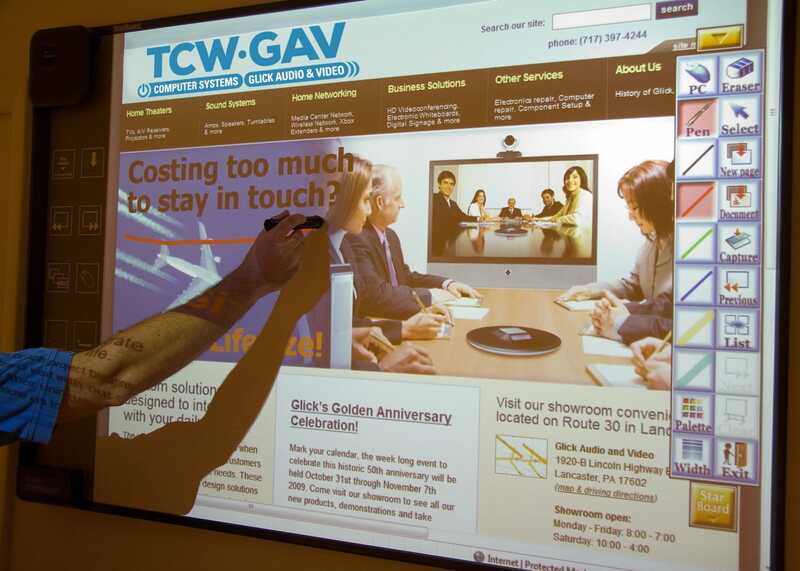 TCW-GAV carries the best brands in town, including digital signage software for Mac. A growing number of businesses are making digital whiteboards a new addition to their meeting toolbox. Installing an interactive display or digital whiteboard in a conference room allows meeting notes to easily be taken and projected for meeting attendees. Those notes can be saved for later review and can also be emailed to attendees. Ready to create a visually and acoustically stunning experience for your business environment? Call today to schedule a site visit with one of our professional designers.